This essay is a continuation of Anupama Menon’s This American Life series. The first three essays can, respectively, be found here, here, and here. My first student job was to work as a Parking Lot Attendant for five days a week, four hours a day. 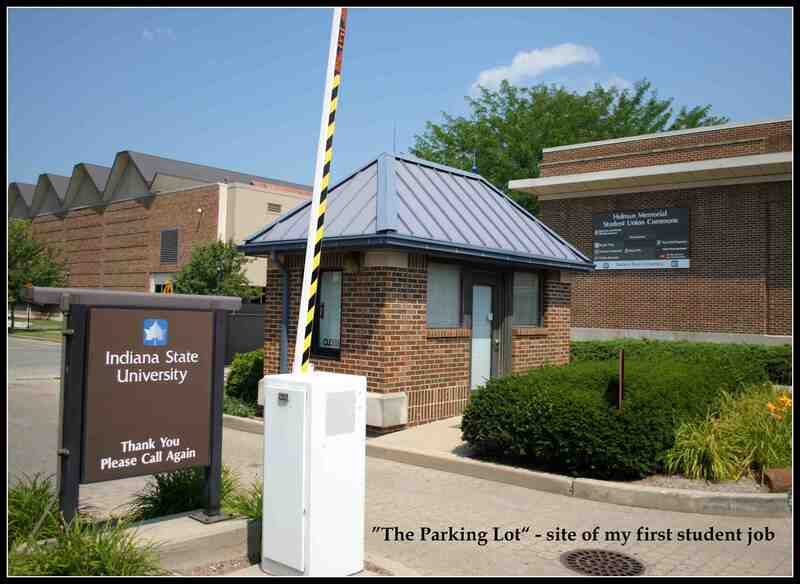 It was a paid parking lot behind the University Commons – the gathering place for students, which had a food court, book stores, a huge fountain, the computer lab, etc. The patrons would take a ticket, which would have a time stamp, from the machine as they came into the lot. When they left the parking lot, they would stop at my booth and give me the ticket. The ticket reader in the booth would then tell me how much they owed, I would enter their payment into the cash register, and open the gate for them. Simple, Right? Ajith was ecstatic when he knew that I’d gotten the job – that moment, I actually wanted to punch him in the face, and walk back – TO INDIA. Two months before, I was working at Sun Microsystems, Bangalore, doing some pretty important work for corporate America and here I was now, in the Land of Opportunities, working as a Parking Lot Attendant! I sat in the food court and wept generously over my Subway sandwich, choking on my decision to come to America. I realized that there was no way I could do this job and there was no way I could NOT take this job. I was terribly homesick and just wanted to erase the past few days and be back safe in the comfort of my home. After two days of hearing how lucky I was to get a job in the first week of my landing here from everyone we met, I decided to report for the gig. The “boss” came by to train me, told me how each transaction needed to be done, and prepared me for every single scenario that could arise. Well, almost. In about 15 minutes after the training, a car pulled up by my window and the driver gave me his ticket. Oblivious to the fact that this was my first time being a Parking Lot employee, he sat in his car waiting for me to tell him how much he needed to pay. I told him the amount with a smile, but little did I know that the worst was yet to come. As the unsuspecting man handed me a couple of coins and waited for his change, a sudden realization dawned upon me. I didn’t recognize this currency!! I knew there was no point in pretending that I knew anything about anything. So I took one bold step and told him that I was new – new to America and asked him what the coins were. Luckily, he seemed to be the patient kind. He showed me how to recognize quarters, dimes, and nickels. I thanked him, gave him his change and he left the lot. I wanted to forget this incident right then and never remember it again. Obviously, that did not work too well. I remember it vividly after ten years. I remember feeling truly like a fish out of water. I was hating America, and wanting to totally verbally abuse Ajith for not telling me how bad things were here. I spent most of my free time in the parking lot pretending that I did not exist. I was embarrassed to be working there, until another Indian student I knew stopped at my booth one day. He asked me whether I knew where a particular department was. Of course, I had no clue, and I asked him why he was headed there. He pulled out a pile of yellow envelopes from his bag and told me that he was working with the University Mail Service. He had just landed, like me, and this was his job – University Mail Man. He had to walk across all these acres and figure out locations of different offices to hand over inter-university mail. I felt a little plush in my air-conditioned cabin. That afternoon, I had a slice of pizza for lunch and felt a little better about my life. This opened my eyes up a little bit. I saw students working everywhere. There were students working in restaurants inside the food court – serving and cleaning dishes, mowing the lawn, painting, fixing computers, in the library as assistants – the list goes on. Every department had student workers. I continued my work as a parking lot attendant with a newfound respect – the much talked about “dignity of labor” had found me. About a month after I came to the US, I was lucky enough to get my scholarship and assistantship from the International Affairs Department at the University. I helped redesign their website, helped new international students in need of any assistance, coordinated new student orientations, and delved into some market research to understand how we could recruit more international students. During a slow summer there, I also helped one of my colleagues build her house. I would go there on weekends, put on a pair of old overalls, and help her lay carpet, paint walls, etc. She paid me by the hour and there could not be a happier me! She owned a huge ranch behind her house and had three or four horses. After we were done for the day, I would freshen up, change, and walk back with her to the ranch to feed the horses. I loved it! Intermittently through the two years, I took up various part time teaching jobs. Mostly math and physics – and some students gave the word “challenge” a new meaning. After a couple of these teaching appointments I began to rethink my fall back career option of teaching. All the while, while keeping my grades up as a student, I kept myself busy with odd jobs. The classes for my MBA were yet to begin, but I had already learnt an unbelievable lot. An MBA student in USA – a whole new episode! Eagerly waiting for your follow thru and intriguing write-up Anu..